Not long ago, I wrote an article explaining why some e-cigarettes cost so much more than others. In the article, I mentioned a particular e-cigarette that sold for as much as $350. The product in question was the White Cloud Cirrus — once the most expensive e-cigarette on the market. Times change, though, and White Cloud has lowered the price of the Cirrus by more than half in an attempt to get a bit more attention from potential customers. Has it worked? I’m going to give you the scoop in my White Cloud review. View the selection of products at the White Cloud website. White Cloud e-cigarette kits start at $39.95 and can be returned for a full refund within 30 days of purchase. The White Cloud Cirrus uses a type of e-cigarette battery and cartridge known under the model name “KR-808.” I recommend this model of e-cigarette in my article about the best e-cigarette for beginners, although I suggest a different brand in that article for a few reasons. For most people using e-cigarettes for the first time, the KR-808 battery offers the best of all possible worlds; it gives you the long life and substantial vapor production you’d expect from a larger battery while still being only slightly larger than a real cigarette. 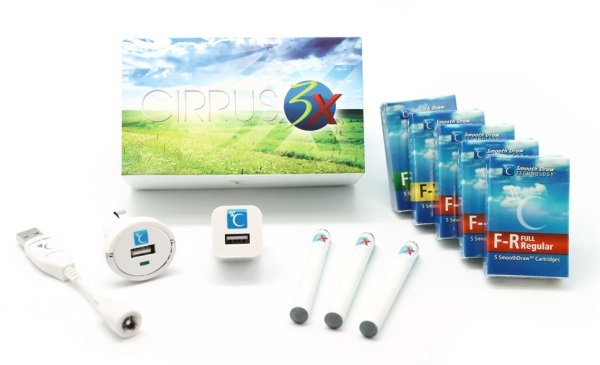 For $49.95, the basic White Cloud Cirrus kit gives you two batteries, a USB charger and five refill cartridges. The more expensive kits give you extra features such as a car charger, extended capacity batteries and more refill cartridges. When you need to purchase refill cartridges for your White Cloud e-cigarette, they’ll start at $2.79 each. You can save money, however, by buying your cartridges in larger packages. Although White Cloud’s selection of accessories isn’t quite as large as some other companies’, there are a few interesting items that you might consider adding to your shopping cart if you purchase a White Cloud starter kit. One of these is the Shotgun, a soft mouthpiece that allows multiple e-cigarettes to be used in tandem for mixing flavors or getting more of a nicotine hit from each puff. I found the Shotgun difficult to use effectively, but the same wasn’t true of White Cloud’s Squid charger. The Squid is a clever little USB device that charges up to three White Cloud batteries simultaneously, automatically cutting off the flow of power to each of the batteries independently as they fill. This greatly reduces the amount of time you’ll spend charging your batteries at the end of the day. For me, reviewing the White Cloud e-cigarette was a pleasant surprise. Compared to top competitor VaporFi, White Cloud doesn’t have quite the vapor production or selection of accessories. If you didn’t have an opportunity to try both e-cigarettes, though, I’m certain that you’d be happy with White Cloud’s product. Not only did I think that the vapor production of the White Cloud e-cigarette was unusually good, but I also thought that White Cloud’s refill flavors were better than average. I especially liked the Bora Bora flavor, which had a more convincing tobacco flavor than almost any Chinese e-liquid I’ve ever tried. One of the downfalls of the White Cloud e-cigarette is the fact that it is only available with automatic batteries. With an automatic battery, you have the convenience factor of not needing to hold a button down when you want to use your e-cigarette. However, when you puff on an automatic battery, there’s always going to be a slight delay before you actually start to get vapor. This doesn’t happen with manual batteries because you can hold a manual button when before you bring the e-cigarette to your mouth. That’s why the vapor production of V2 Cigs is a little better than that of White Cloud. Overall, though, I think that the White Cloud e-cigarette is a really good one even if it isn’t quite the best e-cigarette on the market. White Cloud’s price cuts have made them a very compelling company to buy from, and their selection of refill flavors has a lot to offer most e-smokers. If you’re an extremely heavy smoker, it’s also worth noting that White Cloud is the only company I’ve been able to find to date that sells a refill cartridge with more than 50 milligrams of nicotine per milliliter. I’d never recommend buying that strength unless you already have experience with e-cigarettes and you’re positive you need that much nicotine, but it’s nice to know it’s available.